The general premise of Penguins of Madagascar should be simple enough from the title alone – a spin-off movie that stars the four espionage penguins from the popular Madagascar franchise as they embark on their very own adventure of covert infiltration and martini shaking… Or rather, I thought it was that simple. Early on, we are treated to a origin story that, unfortunately, wasn’t much of an origin story. In the white, desolate coldness of the Antarctic, the sweeping camera pans over a flock of penguins as they march – or rather, waddle – listlessly in a uniform line into parts unknown. Within that particular flock are three tiny tots, who we immediately recognize as seventy-five percent of our titular protagonists asking why things are why they are (I have no idea why they sound exactly like they do as adults), and resolve to break free from ‘nature’. Long story short, they see a egg rolling uncontrollably, rescue it from an abandoned ship full of seals, hatch their final member, the insufferably cute Private, and thus ends the ‘origin’ part. My main gripe with this is how it was never explained how the three got together, or how, from the get-go, they are capable of flawless teamwork and the extraordinary feats of spy-lethics that has became their trademark. I guess we just have to assume they were born to be much more than just mere penguins. Fast forward, into the future, as they again escape being captive show penguins via giant circus canon, and invade Fort Knox’s gold deposit to buy Cheesy Dibbles from a vending machine inside a vault to celebrate Private’s 10th birthday of being adorably useless (I am not making this up). They get abducted by said vending machine who suddenly sprouts tentacles and are taken to a submarine. The big reveal then being that their kidnapper was their forgotten zoo (not)mate Dr. Whatchisname. Dale? Ramirez? Anyway, they escape, try to foil Dale… Dave’s plan while begrudgingly teaming up with another spy team with seemingly endless financial back-up, North Wind, but they ultimately fail, Private gets captured, they rescue him, foil Ramirez’s plan to turn all penguins in the world into ugly creatures, someone gets the girl (owl), and sunshine and rainbows as the penguins fly above the clouds in dramatic fashion via jet-pack. End. Now, this movie is far from original. Far from beating the dead horse, the plot hopes it can somehow turn the body into fertilizer. I’m not saying it’s bad, I’m just saying it was ‘meh.’ It doesn’t disappoint, but neither does it overwhelm. Another issue of mine is the general direction of this movie. Was it intended to be an origin story? A revenge story? Private’s coming-out story? Or did the writers just cram everything into a juicer and hopes it blends into something you can gulp down without flinching. The jokes are snappy and crisp, and will appeal to both kid and and adult alike, but the fast-paced, in-your-face, sugar rush type delivery can fly over the heads of most people, especially when you have multiple characters on-screen talking and shouting at the same time, and all it creates is noise you can’t quite decipher. This is especially evident in the scenes North Wind is in – particularly, when they’re arguing with the penguins. Benedict Cumberbatch was great as the smooth, James Bond-esque Classified, but I feel his muttering of his lines, coupled with his raw British accent, makes me turn my head in confusion from time to time. And I just can’t plain understand Corporal, the polar bear, who’s even worst at delivering his lines. I think I only understood half of his entire script. I can’t even bother to write a long review for Dave. Basically, he’s your typical villain (with his own unlimited financial backing and genius IQ that was never explained) that wants revenge for being born ugly and jealous about it. Penguins are cute; get over it, Dale! Basically, the movie aims to throw as much eye-candy and rapid-fire jokes at you as possible to make you forget about the rather dull plot in hopes that you’re too busy laughing to think. It achieves that to some degree, but doesn’t deliver anything too memorable that will leave with you outside the theater. The ups and downs weren’t quite were they needed to be. I couldn’t invest myself that much into the characters, thus can’t feel sad in the sad parts, or too enthusiastic when they stood triumphant with the power of cuteness and snow-globes. Make no mistake about it, though; I laughed. A lot. Enough to not quite care that it was a run-of-the mill story probably crafted by throwing darts at a wall with cliches taped on it. It’s a winter comedy that harmlessly aims to take a little of your time as you continue to wait for the triple A movies coming next year. 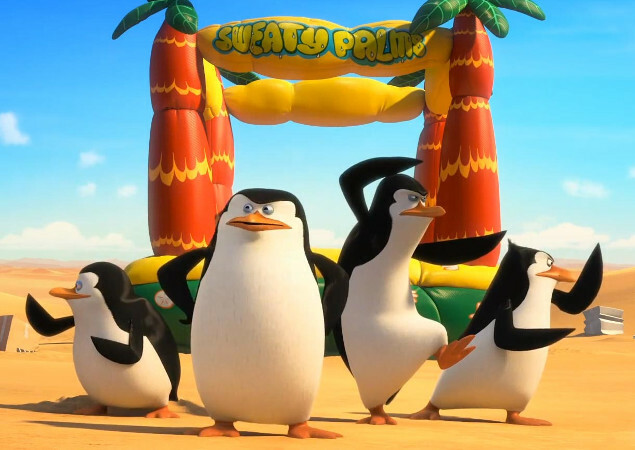 Penguins of Madagascar is a fun little movie to ease you towards the end of 2014. It’s not extraordinary, but within that little bundle of black-and-white fluff of ordinary, you might find a little extra to keep you satisfied.